Those of you visiting Monaco this week will have noticed, in addition to the usual beautiful Christmas decorations on Casino Square and the ubiquitous Christmas market on the harbour, a certain air of joy in the air and spontaneous celebrations throughout the Principality. HSH Gabriella Thérèse Marie, Countess of Carladès (born at 5.04pm). HSH Jacques Honoré Rainier, Hereditary Prince and Marquess of Baux (born at 5.06pm). 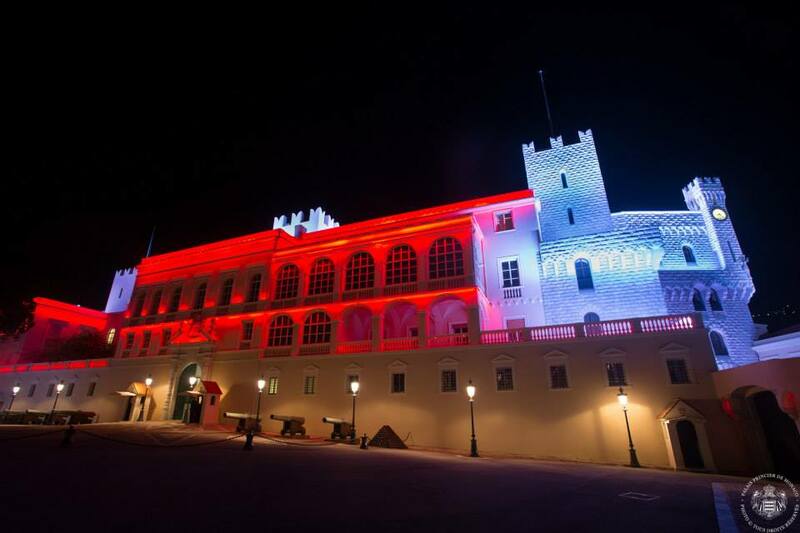 Flags and decorations all over the Principality, especially the pink flashing lights in front of the Prince’s Palace. A 42-gun salute for the twins (normally it’s 21 for each birth but obviously this time the budget has doubled! ), followed by the ringing of bells and the sounding of the horns of the yachts in the harbour. 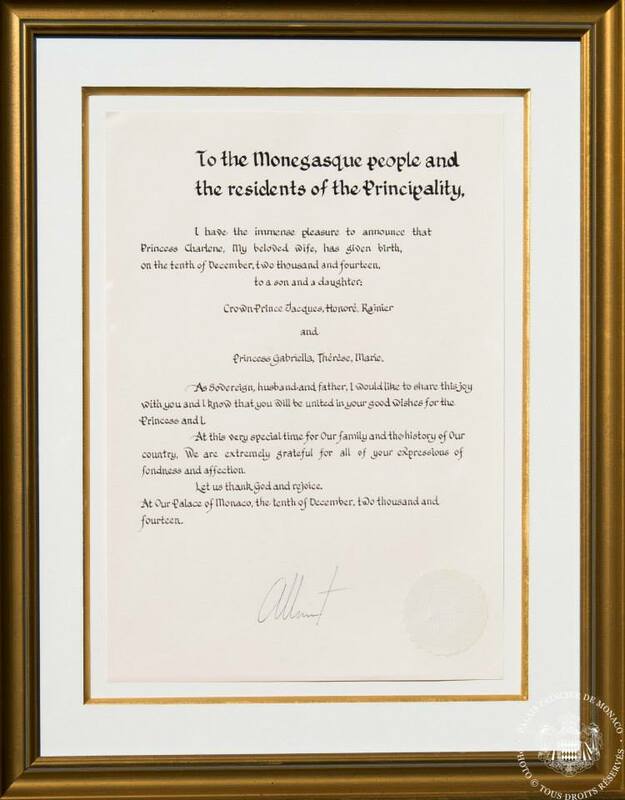 An official announcement signed by Prince Albert was posted on the doors of the Palace as well as a guest book that can be signed by the local population. 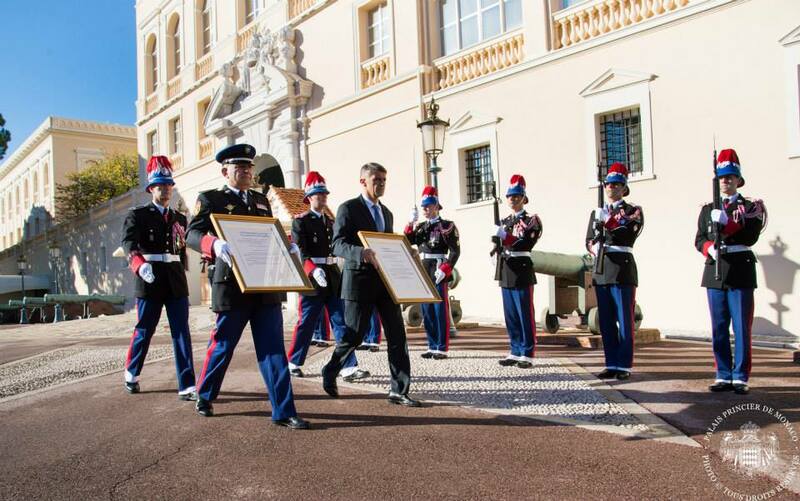 Most importantly for the 40.000 or so people who come to work in Monaco every day, the 7 January will be a one-off public holiday, as it marks the official “presentation” of the new children to the population of Monaco. Those of you arriving in Monaco for the first time will see all these special decorations, posters in the street, as well as the ubiquitous portraits of the Prince and Princess all over the Principality and wonder why all the fuss. 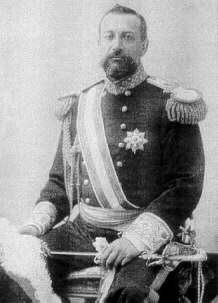 The main reason is that there is a very close link, forged over hundreds of years of history, between the Princes of Monaco, the royal House of Grimaldi and the people – not just the 8.000 or so Monegasque nationals, but also the 28.000 or so members of the various international communities living today in the Principality. 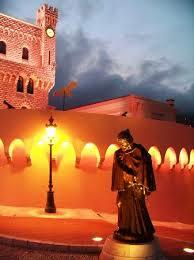 In this respect, Monaco is both a sovereign nation with its own culture and identity, but also a village. The Prince of Monaco is in absolute terms with regards to the size of the country one of the world’s most powerful monarchs, despite Monaco being a constitutional monarchy and is in charge of pretty much the whole governance via several delegations. There were huge public outpourings of grief upon the death of Prince Rainier III in April 2005 and conversely moments of joy upon the accession of Prince Albert II three months later and his wedding in July 2011, just like this week with the birth of the Royal twins, hence the emotions of the population running quite high here. The Genoese Grimaldi family took over the Principality in 1297 and apart from a few interruptions has reigned almost continuously since, thereby making it one of the world’s oldest reigning families. How did they get there in the first place? François I, also known as “Malizia” took advantage of a stormy January night in 1297 to dress like a monk along with some soldiers. The team then knocked on the door begging for alms, then took out some swords hidden under their cloaks and promptly took advantage of the surprise effect to gain control of the castle, which is now the Palace of Monaco – you can read more about the history of the Palace on the official website. 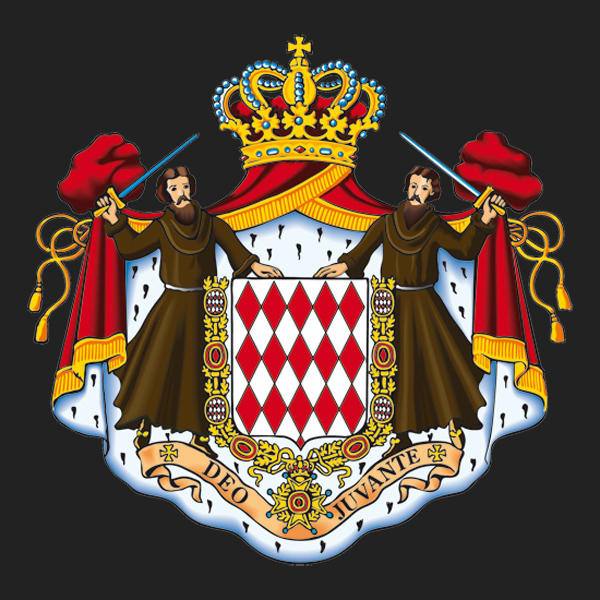 This is actually why there are two monks holding swords on Monaco’s coat of arms. 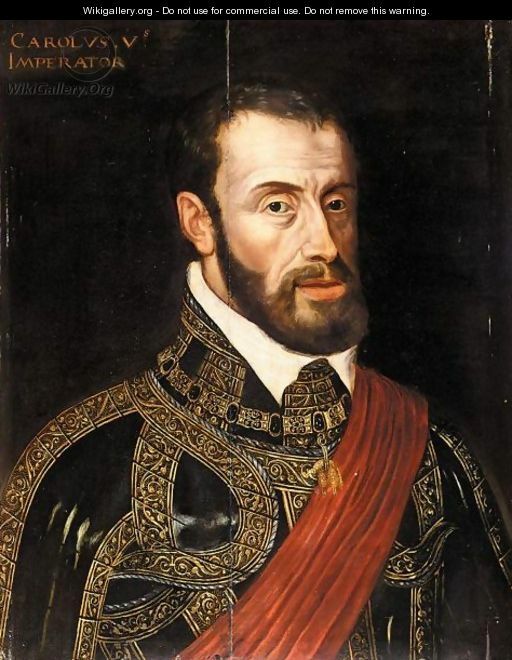 Monaco maintained its independence over the centuries thanks to the negotiation skills of the Grimaldi family, who obtained protection from some of the massive empires of the day: Spain, led by Charles V in the 16th century, then France, then the Kingdom of Piedmont-Sardinia. The title of the newly-born Prince Jacques is the Marquis des Baux: this refers to the area surrounding the village of Les Baux de Provence located some 250km to the west of Monaco which was donated to Prince Honoré II (1597 – 1662) in 1641 in the Treaty of Peronne. This title is bestowed to all the hereditary princes of Monaco and, in the absence of an heir, it is kept by the ruling Sovereign: for example, Prince Albert II kept the title of Marquis des Baux from his birth in 1958 until the birth of his son, Jacques. The Treaty of Péronne also granted to Monaco the Duchy of Valentinois (now the area around Valence on the Rhone river in southern France) and, most interestingly in this context, the county of Carladès, centred around a rather obscure rock in the Auvergne region of Central France. These areas are now part of French territory but at the time granted substantial tax revenue to the Princes, who used this to embellish the Palace which was more of a medieval castle before then. The county of Carladès has recently gained its share of limelight as the newly-born Princess Gabriella’s official title is the Countess of Carladès. The rock of Carlat in Auvergne, part of the county of Carladès which now has a new Countess! The French revolution stirred up a bit of a mess, with Monaco being annexed in 1789 and being renamed Fort d’Hercule. It only regained its pre-1789 situation (and the name of Monaco) in 1814 during the French Empire. 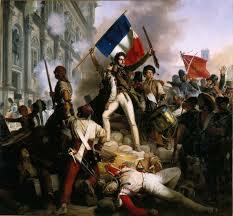 The French Revolution also affected Monaco quite a bit as the bloodthirsty mobs didn’t really like crowned heads…! Up until 1847, the Principality also incorporated the communes of Menton and Roquebrune whole were the “economic powerhouses”, generating exports of olives and lemons. They decided to secede in 1848 and officially joined France in 1861, bad idea as their inhabitants have ended up having to pay French income tax ever whilst Monaco is free of any personal taxation. 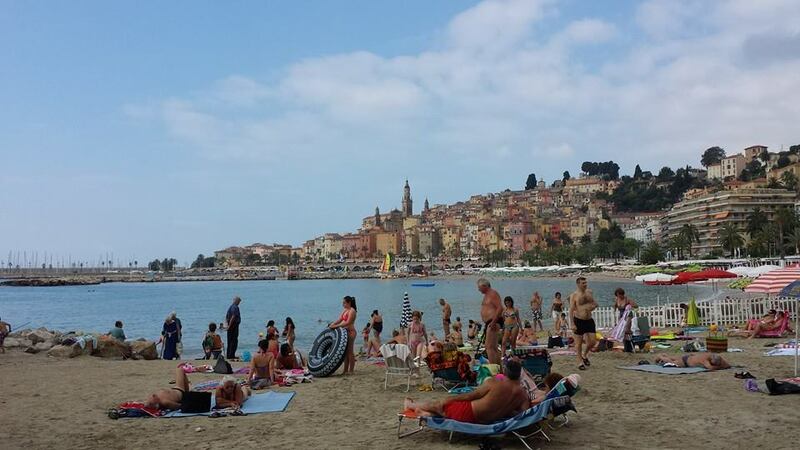 Menton – once part of Monaco! Why no taxes? Monte-Carlo used to be an empty grazing field for herds of goats and sheep during the winter season, but thanks to his entrepreneurial and marketing skills, Prince Charles III (1818-1889) doted the area with a new casino and opera house (which were the big fad at the time) and took advantage of the new coastal railway line and roads to market the new “Monte-Carlo” (Mount Charles) as a winter spa resort with 5-star luxury hotels. This brought in so much income that the Prince made a pragmatic and very strategic decision in 1869 to remove direct personal taxation for all residents. 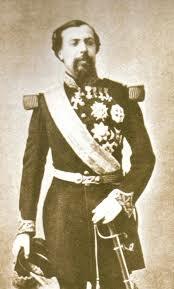 Monaco was an absolute monarchy until 1911 when the first constitution was drawn up under Prince Albert I (1848-1922), thereby becoming a constitutional monarchy which is its status today. 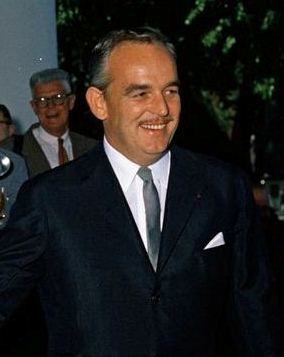 Prince Rainier III (1923-2005) took over in 1949 and at the time of his death was one of the world’s longest-reigning monarchs after a 56-year reign, just after King Bhumibol of Thailand whose reign began in 1946. He also generated huge economic growth for the Principality, promoted some massive building projects and gave it the appearance that it has today. 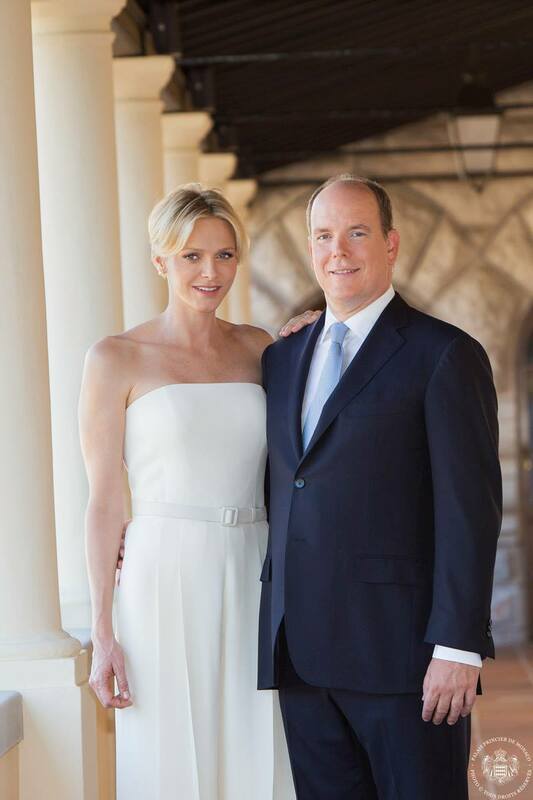 Hope this has given you a bit of extra general knowledge about the Principality and to conclude, the French Riviera Blog offers its warmest congratulations to the Prince and Princess and wishes all the best to Prince Jacques and Princess Gabriella! This entry was posted in The Principality of Monaco and tagged french riviera, frenchrivierablog, Monaco, monte carlo, palais, prince albert, prince jacques, princess charlene, princesse Gabriella, principality. Bookmark the permalink.